Long-duration observations of horizontal currents throughout nearly the entire water column at a location in the Kauai Channel, Hawaii (21.75˚N, 158.75˚W), are used to test hypotheses about the existence of energetic oscillations driven by non-linear processes acting on the semi-diurnal tide. For decades it has been believed that three classes of resonant interactions, based on weakly interacting, non-linear wave theory, are the dominant mechanisms for moving energy through frequency-wavenumber space of the internal wave field. Energy is thought to flow from sources, such as the tides and wind-forced inertial waves, toward small spatial scales and dissipation. A number of recent studies have suggested that non-linear processes, such as Parametric Subharmonic Instability, will result in a flow of energy from the principal semi-diurnal M2 tide directly and quickly into small-vertical-scale oscillations at the M2 subharmonic frequency, M1 = M2/2 (0.966 cycles/day, or cpd), and that this can occur anywhere equatorward of 28.8˚ latitude. However, numerical experiments have been highly idealized, and most observational studies lack sufficient frequency resolution to spectrally distinguish between linear diurnal tidal constituents and oscillations of M1 frequency. 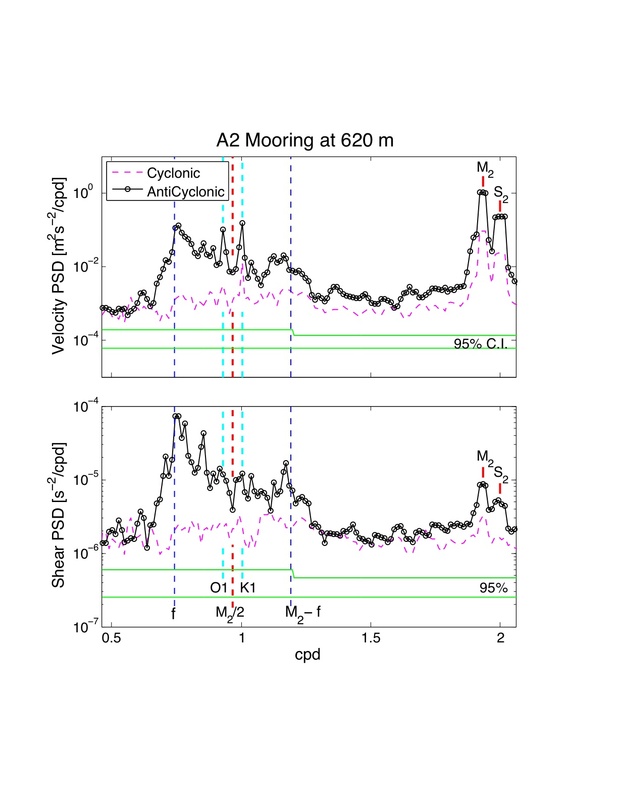 Observations for this study come from moored Acoustic Doppler Current Profilers (ADCPs) which were deployed from November 2002 to June 2003 in the Kauai Channel as part of the Hawaii Ocean Mixing Experiment (HOME). These velocity time-series cover nearly the entire water column with 8-m resolution, and are long enough to clearly resolve in frequency the energy in M1 currents as distinct from currents forced by the principal diurnal tidal constituents O1 (0.930 cpd) and K1 (1.003 cpd). Energetic semidiurnal tidal beams are observed in this dataset, and diurnal-band spectral energies in both velocity and shear fields appear to be dominated by locally generated internal tides at O1 and K1. The ratio of velocity power spectral densities at M1 relative to M2 is approximately 10^(-2), which is lower than expected from some numerical simulations. We find with bispectral analysis that a triad of waves with frequencies at O1, K1 and M2 has higher bispectral energy (by an order of magnitude) and higher bicoherence (> 0.1) than a triad with frequencies at M1, M1 and M2 from 420-1000 m at this location. otherwise, every third point is independent.